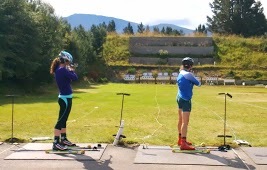 The Biathlon courses at Glenmore Lodge may be over for the summer but hard training is just starting for Biathlon Team members of Cairngorm Biathlon and Nordic Ski Club, which training base is at Glenmore Lodge. The Team have been ramping up the training over the past couple of month in preparation for the Winter Season. A team of 6 shall be heading to Rupholding in Bavaria for the British Biathlon and Nordic Ski Championships. The Chemgau Arena where the championships is the base of the German National Team. Members of the team have been training every Saturday for 3 hours with the coaching team, plus additional hour’s roller skiing and gym session themselves, in addition to school. One of the team has been training and racing in Norway since September and another has just headed out to Obertilliach for some on-snow training for 4 week. Biathlon has hit the TV screen with coverage of the IBU World Cup starting on Eurosport on Sunday 24th November and the non Televised IBU Cup (second tier) started on Saturday 23rd November. With many of the athletes setting their sights on World Cup and Olympic Qualification. CBNSC athlete Scott Dixon successfully qualified for World Cup circuit in challenging wind conditions in IBU Cup in Idre Sweden on Sunday 24th November. Scott then travelled to Beitostolen, where conditions can be described as “Scottish”, high winds, fluctuating temperature and artificial snow, the conditions did not settle of the weekend racing giving challenging conditions. 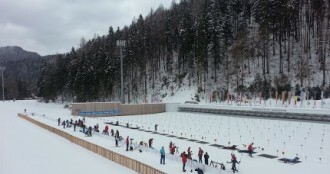 Keep up to dates with GB Team results at www.britishbiathlon.com or www.biathlonworld.com.